In 1966 IBM mainframes could only connect to other IBM mainframes, Burroughs only to other Burroughs, etc. Beginning in 1967 the US Defense Department’s Advanced Research Projects Agency (ARPA) office sponsored development of a “heterogeneous” network compatible with computers from any manufacturer. That R&D effort, one of the most successful in history, resulted in the on-time, on-budget construction of the revolutionary ARPANET, the immediate predecessor of today’s Internet. 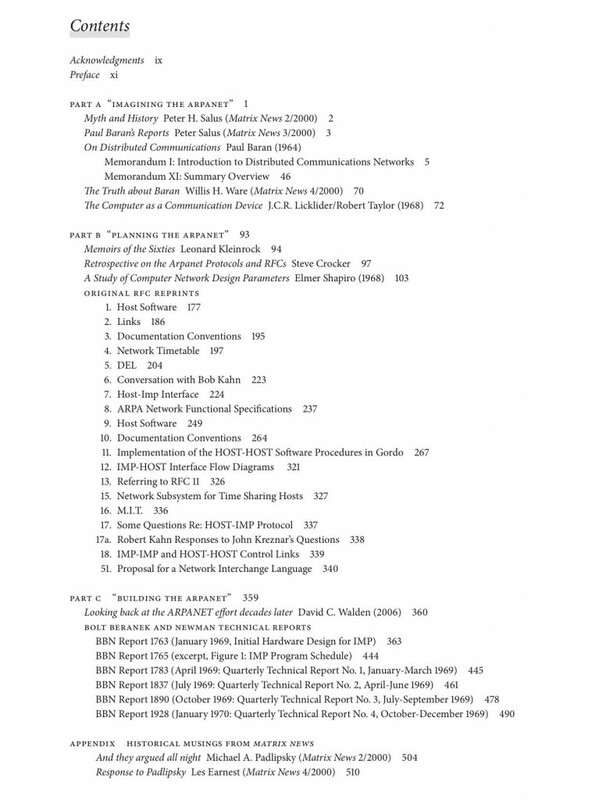 The ARPANET Sourcebook: The Unpublished Foundations of the Internet reproduces the seminal papers, reports, and RFCs that led to the birth of modern network computing. Most appear here in book form for the first time. the introductory and concluding chapters of Paul Baran’s seminal but little-known RAND research report On Distributed Communications in which packet switching was first conceptualized. the classic 1968 paper The Computer as a Communication Device by J.C.R. Licklider and Robert Taylor, respectively the ARPANET’s earliest proponent and the ARPA administrator who pushed the development project. scans of the earliest RFCs (“Requests for Comments”), some publicly available here for the first time. RFCs were in effect the design documents for the ARPANET and later the Internet. the 1968 ARPA-commissioned SRI study that modeled a heterogeneous network and concluded that it was indeed feasible. forewords by Steve Crocker (author of RFC #1) and Leonard Kleinrock (noted author and head of the UCLA computing lab that hosted the first ARPANET node). Part C, Building the ARPANET, reproduces the quarterly technical reports from the government’s contractor Bolt Beranek and Newman contemporaneously describing the development group’s progress, difficulties encountered, and final success. Dave Walden, former BBN VP and a key member of the ARPANET team, has contributed a retrospective Foreword. Other noteworthy material: historical perspectives from Peter Salus, Robert Taylor, Willis Ware, Michael Padlipsky, and Les Earnest, and a long-forgotten RFC which anticipated JAVA by more than 20 years. In 1968 there was no network at all. In December 1969, there was a network of four sites. On January 11, 1971, Alex McKenzie (in Cambridge, MA) wrote to Nico Habermann (at Carnegie-Mellon University), inviting him to join the network, estimating that there would be “a network user community of 2000, distributed over 14 sites.” Today there are over two billion users, spread over several hundred million sites. This volume contains the original documents. The dreams, the proposals, the reports. Peter H. Salus has served as Executive Director of USENIX and The Sun User Group and Vice President of the Free Software Foundation. He was Managing Editor of the journal Computing Systems from 1987-98 and advised Peer-to-Peer on books for the “Computer Classics Revisited” series. He is the author of several histories, including Casting the Net: From ARPANET to Internet and Beyond and A Quarter Century of UNIX (both Addison-Wesley). Salus holds an undergraduate degree in Chemistry, a master’s degree in Germanic languages, and a doctorate in Linguistics from New York University.